The final battle of Advance Wars recreated in Wargroove by a player using the game’s map editor. 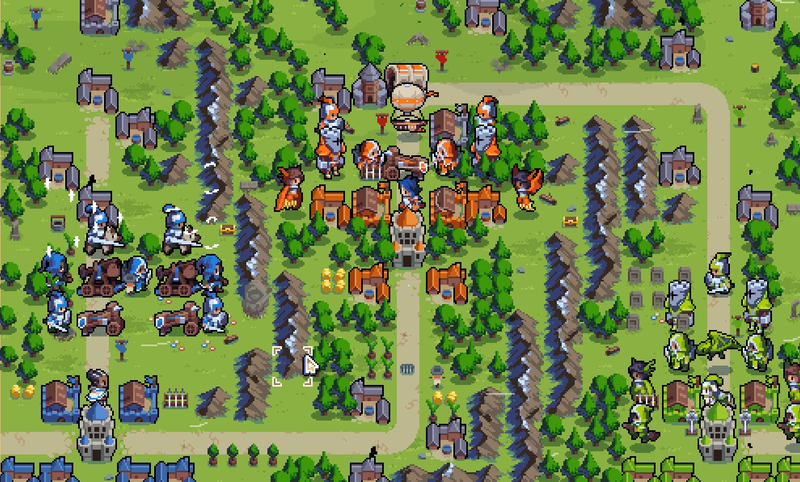 Wargroove is an excellent spiritual successor to the Advance Wars series, and in keeping with the tradition of those games, it comes complete with a robust map editor that players can use to make all sorts of interesting stuff., One player used it to remake the campaign from the original Advance Wars. Though it’s been out for less than a week on Xbox One, Switch, and PC, Wargoove already has over two hundred player-created maps that you can download online and try out for yourself. You can play them even if you haven’t yet finished the main campaign. My favorite of these so far is the one with a mini-campaign that recreates the first four missions from 2001’s Advance Wars for the Game Boy Advance. According to the person who created the remake, reddit user HalcyonsGlory, the only changes from the original involved accounting for the fact that unlike in Advance Wars, units in Wargroove can’t move onto squares occupied by buildings. Otherwise, it’s spot on. HalcyonsGlory plans to finish the rest of the campaign at some point. It will end up including some extremely brutal battles, like the fifth mission against the sniper Grit, as well as the final battle in which the odds are extremely unfavorable. If you really want the authenticity of the original, you can always download it from the Wii U’s virtual console, but for strategy game lovers without that option, it’s a nice bonus to have the capability to play this remake within Wargroove. Players have also designed their own Fire Emblem levels, including the first 10 chapters of Lyn’s story mode from 2003’s Fire Emblem on the Game Boy Advance (known in some circles as Fire Emblem 7). Since that strategy series is based around unique character units rather than generic ones, the Wargroove version of it doesn’t work quite as well, but it’s still neat to try it. While the Advance Wars games had map editors, players have historically relied on hacks in order to make custom Fire Emblem maps. Given how straightforward and easy to use Wargroove’s editor is, it would be great to see this year’s upcoming Fire Emblem: Three Houses for the Switch incorporate a similar editor. You can download fan-made maps by going to the game’s custom content section and then browsing online by map title. Once downloaded, the campaigns are available under the single-player section while individual maps built for multiplayer require you to launch them from the multiplayer section. The tools allow you to customize everything that appears on the map, from units and terrain to decorative landmarks. You can even create short cutscenes and design unique win conditions, but without too many options that the tools becomes overwhelming. Wargroove’s developers at Chucklefish acknowledged designing the game’s map editor with ease of use in mind back during a demo of the tool at E3 2017. Thanks in part to the game’s strong launch, players are already making good use of the editing tools. Chucklefish announced over the weekend that the game’s already sold enough to cover the game’s development costs and the studio is already working on a patch to improve some of the UI and add DLC down the road.